Last Friday, I got the rest of the top and bottom edge triangles pieced from leftover strips and scraps. Mostly, the joins are a bit obvious in the busy patterns of Fox Field but look! A completely accidental pattern match! I’m rather tickled with it. Husband helped me lay out the quilt and make sure that the colors were balanced and then I got to sewing the top together. It is probably going to be around queen sized, especially if I add a nice border of the leftover cream geo print that I didn’t use to make the top and bottom triangles. Husband really likes this quilt too and might insist we keep it. Fields of Foxes is my June Lovely Year of Finishes goal. Go big or go home, right? I need to work out backing; part of me wants to splurge for a great whack of the Fox Trot print and another part of me insists on using what is in the stash, which is probably wiser and more thrifty. While I’m pondering backing, I started on another WIP project. You may remember that I wanted to requilt my first quilt ever, Foxes Out My Window, which I got started on this week as well. I removed the binding and ironed it, and then started pulling out the quilting. I’m starting from the middle and working about a block of space at a time. Luckily, it’s pretty easy, because my old machine had such terrible tension! The quilt still a little crinkly from the first time I washed it, but I like the crinkle and it doesn’t seem to be hindering anything. After these Foxy WIPs done, I have a whole bunch of ideas of what to cut next: a plus quilt, Ring Toss, Metro Rings, something using Tula Pink’s Salt Water or Acacia lines, experimenting with the Quick Curve ruler… I think the planning and drafting stage may be one of my favorite parts of all this! I’m linking up with WIP Wednesday at Freshly Pieced. Oh and hey! Lee also started hosting #WIPWednesday on Instagram too – I’m lucymade over there as well! Wow. 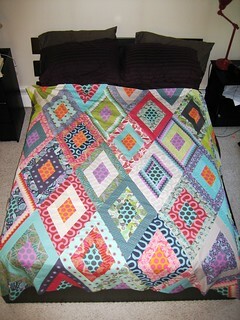 What a gorgeous quilt, Lucy! Now you have me wanting to go buy these yummy fabrics (I’ve been able to resist up till now….;o). 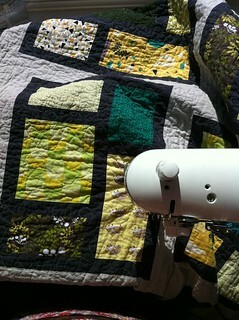 Well you know if you can pull quilting out that easily it needs to come out! lol Have fun re-doing it. You’ll feel better about it. Pretty quilt! I agree, the planning and dreaming stages are as much fun sometimes as the making of a quilt. Hope you can decide on a backing!!! I’m glad to know your requilting is going well. I have one I’m thinking about doing. Certainly not my first quilt, but must have been one of my early feather attempts. Love the colors, but cringe every time I look at the quilting. I’m thinking I can do it without removing the binding. 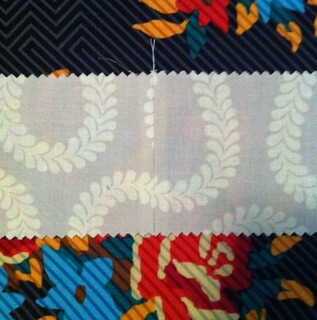 P.S., I vote for the new fox fabric backing! That is a great quilt– very inspirational!